Great White North Technical Evangelist: New Release (2015R3) of the STD "Integrated" FrameWork! 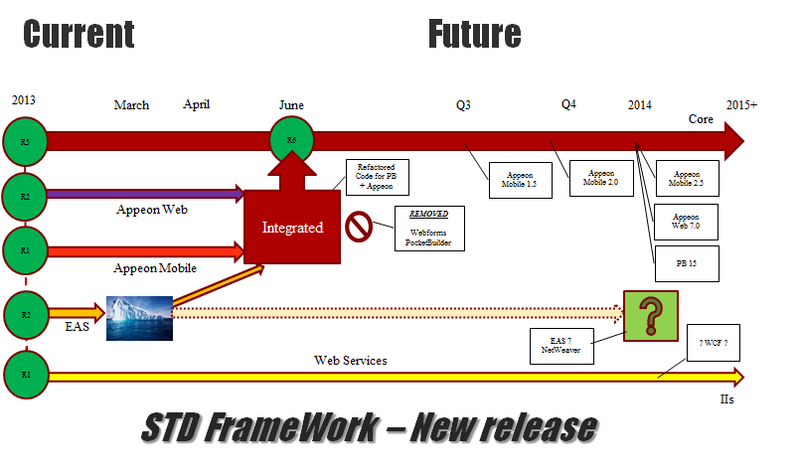 New Release (2015R3) of the STD "Integrated" FrameWork! Integrated Foundation Classes (2015R3) Released! Software Tool & Die Inc (STD) is very pleased to announce that they have just released an updated version 2015R3 (2015.3.0.40) of their Integrated Foundation Class library for PowerBuilder "Classic", Appeon Web and Appeon Mobile! Added new "of_notification_display" method to the Application Controller (nc_app_controller_master) base class. This allows you to send a notification message that becomes a MessageBox in native & web but a real tablet / smart phone notification in the Mobile space! Added new "of_notification_remove" method to the Application Controller (nc_app_controller_master) base class. Revised "oe_help" event of "vs_dc_master" base class to use the new "of_notification_display" Application Controller method. This allows applciations to provide interactive help on each object or column in their applications. Removed the old PocketBuilder "of_set_nb_message" method from the "wn_master" base Window class. Replaced hard coded message text in the "nc_app_controller_master" Application Controller base class. - The AC now utilizes the Message Sub-System to deliver messages! Added new message numbers 72-93 and text to the message sub-system. Revised "vs_dc_webservice_master" abstract class to utilize the new "ns_ws_connection_master" Connection base class. Revised "ns_ds_webservice_master" abstract class to utilize the new "ns_ws_connection_master" Connection base class. Added a new "Web Service DataWindow Section" to the default Application INI file (see above changes for the DC/DS web service ancestor components). Revised the methods in the "nc_app_controller_master" class to use the help sub-system for message text processing. Added new instance variable "is_hint_text" to the "vs_sle_master" base class for Appeon Mobile's of_SetHintText method support. Check out the updated OrderEntry application to see how this works in the Appeon Mobile space! Fixed a bug in the "wn_master" base class to call the related menu's "of_ok2save" method when it is notified! Changed the "of_display_basic_help" method in the "nc_app_controller_master" class to no longer use the old XP "WinHelp.hlp" help. Modified the ""oe_postconstructor" event of "mu_application_master" class to set the related Colour, Log & SMC menu properties. Modified the ""oe_postconstructor" event of "mu_main_master" class to set the Colour, Log & SMC menu item state properly. Added new "About" tab page ancestors in the English, French, Spanish and Italian PBL's. Added new "About" tab control ancestors in the English, French, Spanish and Italian PBL's. Fixed the "Device" about tab page code to correctly display the device ID in the Mobile environment. Revised the "wn_response_master" base class to bypass any ChangeMenu processing on the Mobile platform. - Menus are handled differently by Appeon's AWS on the mobile device. Updated the example OrderEntry application using the latest Integrated framework build and added Italian support!